Fun and easy, this shamrock pattern has endless uses. Make a bunch of them and make a festive St. Patrick’s Day banner or table runner. 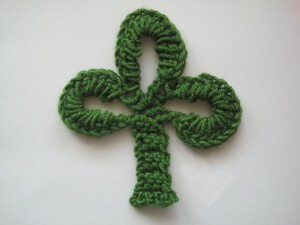 Add one to a Irish afghan or a scarf for a chilly St. Patty’s Day parade! Looking for more patterns? Check out the Crochet Patterns for St. Patrick’s Day post. Finish off, weave in ends. Make it pretty! Have any questions or comments on this pattern? Feel free to share or ask us here! This entry was posted on Saturday, February 26th, 2011 at 12:25 PM by Erin Burger	and is filed under Free Crochet Patterns. You can follow any responses to this entry through the RSS 2.0 feed. You can leave a response, or trackback from your own site. very cute,,I am gonna make some of these and pass them out to friends to pin on there coats.. This looks real easy! I’m going to tr it. Thanks! Very sweet. I think I will make it into a necklace for my kids. Thanks for sharing!